Students should be picked up from the gate behind the main school building. Enter at the rear of the campus from Severin Drive and exit along the east side of the building. In order to keep the traffic moving as quickly as possible, please arrive at your child’s dismissal time, not before. If you must arrive before your child is dismissed, either park in the lot or continue to circle around the building until your child’s dismissal time. Trans-K & K – 2:45 p.m.
2nd Grade – 3:00 p.m.
Grades 3-5 – 3:00 p.m.
Jr. High – 3:15 p.m.
Trans-K, K & Jr. High students- 11:30 a.m.
Grades 3, 4 & 5- 11:45 a.m.
Grades 1 & 2- 12:00 p.m. If you have more than one child enrolled at Mt. Helix Academy, the younger child(ren) will be dismissed at the same time as the oldest. If it is raining, Trans-K – 5 students will be dismissed at the front entrance to the main building and Jr. High students will be dismissed at the Jr. High Annex. Please enter the campus via Howell Ave., proceed to the main building entrance, allow your child to enter your vehicle from the passenger side, and then exit the parking lot via Severin Drive. 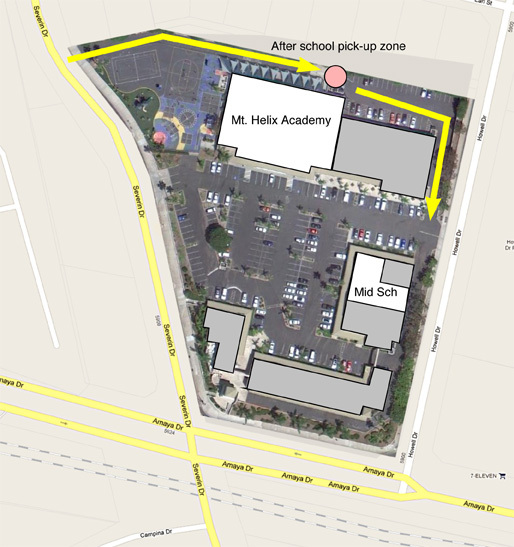 After 4:30 p.m., all students should be picked up at the main building.